Tokyo: Surging flood water brought by a powerful typhoon left nine people dead in an elderly care home in Japan, officials said on Wednesday. 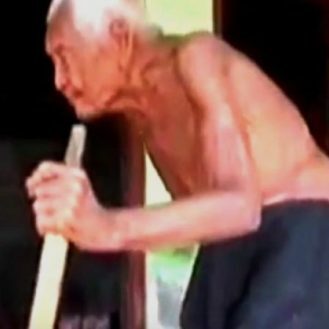 The bodies were discovered in a riverside care complex half buried in mud and rubble after Typhoon Lionrock ripped through the region, dumping torrential rain over a wide area. Footage from public broadcaster NHK showed a helicopter hovering over the building in Iwaizumi, as rescuers tried to pluck other stranded residents to safety. A district disaster official told AFP that the nine elderly people died as a result of mud that swamped the facility. “We are trying to confirm the identities of these bodies,” Shuko Sakamoto, a spokeswoman for police in northern Iwate prefecture, said. The death toll from the powerful storm rose to 10 after an elderly woman was found dead in her flooded home nearby, top government spokesman Yoshihide Suga told reporters. NHK also reported another body had been discovered not far from the nursing home, but there has been no official confirmation. Aerial footage showed a wide swath of flooded land, with parked cars half submerged in murky water. Lionrock slammed into northern Japan on Tuesday evening, dumping heavy rain that caused flooding and triggered power outages. Japan’s Disaster Medical Assistance Team (DMAT) has sent rescuers to Iwaizumi, spokesman Takenori Ueushiro told AFP. The typhoon, which was packing winds over 160 kilometres (100 miles) an hour when it made landfall, also caused flooding on the northern island of Hokkaido. 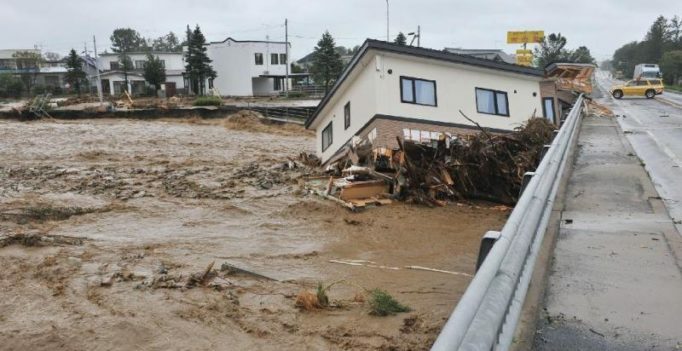 “In Minamifurano town, the water level is still very high with a current, and rescue workers are using helicopters now to try to evacuate several people who are left on the roofs of their houses or their cars,” said Hokkaido official Terumi Kohan. Lionrock’s path – hitting northeastern Japan from the Pacific Ocean – was unusual. Authorities on Tuesday had warned of up to eight centimetres (three inches) of rain per hour, and said they expected flooding and landslides. The typhoon’s landfall came at high tide, which exacerbated the flow of water. Lionrock comes on the heels of two other typhoons that hit Japan in the past nine days, resulting in two deaths, the cancellation of hundreds of domestic flights and disruptions to train services.